Spring is here, which means it’s time to hang up the skates and grab the bat and glove. This year, my son moved up from teeball, which I coached last year, to baseball. Since I’m not coaching this year, it meant having another conversation about epilepsy. I still get nervous introducing people to my son’s condition. I try to strike the right balance between “he has a serious medical condition” and “everything is going to be fine.” It’s hard. Too much information can overwhelm even the most altruistic volunteer. But I’m not doing my job unless I am honest about all the potential challenges. There are times when I wish that I could not say anything. I could hope for the best and let my son take part in an activity without a caveat. After all, he’s not likely to seize. And there are plenty of kids on the team that have a hard time listening or focusing. He could blend in. That would be easier. The coaches wouldn’t have to be scared. I wouldn’t have to worry about him being treated differently. I wouldn’t have to face the reality of our situation. I wouldn’t have to make epilepsy a part of everything that we do. But, the fact is, it is a part of everything we do. And it’s my job as a parent to do what is best for my son. I want to keep him safe but I also want him to enjoy the experience. The only way to do that is to have an open communication channel with the people in his life. 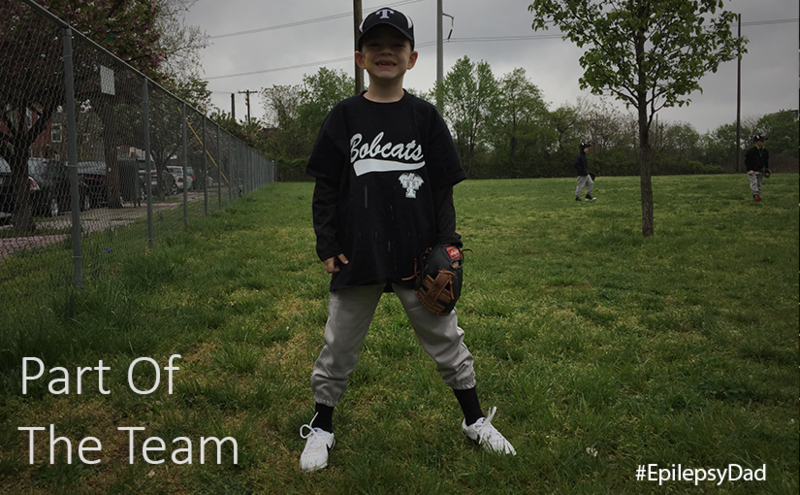 We were told early on that we, the doctors, nurses, teachers, aides, babysitters…we are all a part of my son’s team. And like any good team, everyone needs to be informed so they can play their part. When we talked to his coaches, they thanked us for telling them, then they asked what they could do to help. That night, they reached out to us again to let us know that they were happy he was on the team. To the father of a child with epilepsy, the best way to show that they were part of our team was to make him a part of theirs. They had done that with one phone call, and they continue to do it at every practice. As anxious as I get about doing it, the more we have the conversation, the better we get at it. The better we get at it, the better people respond to it. And the better people respond to it, the less anxious I will hopefully be the next time. Which is good. Because it’s a conversation that isn’t going away. 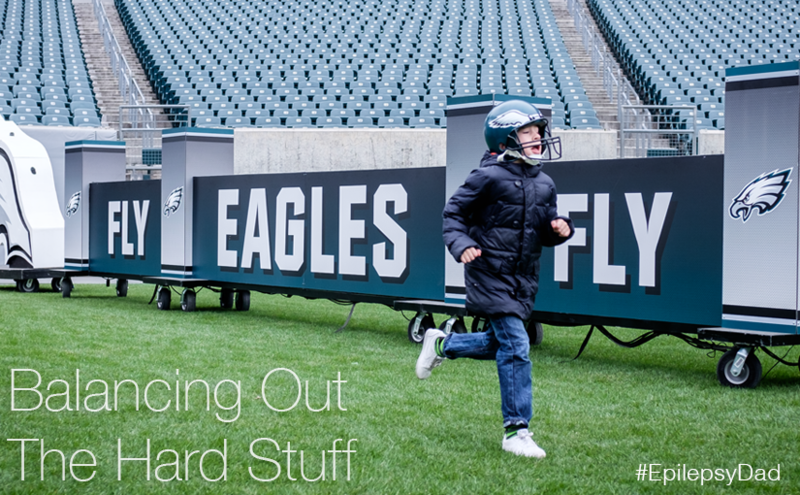 My son feels the need…the need for speed. 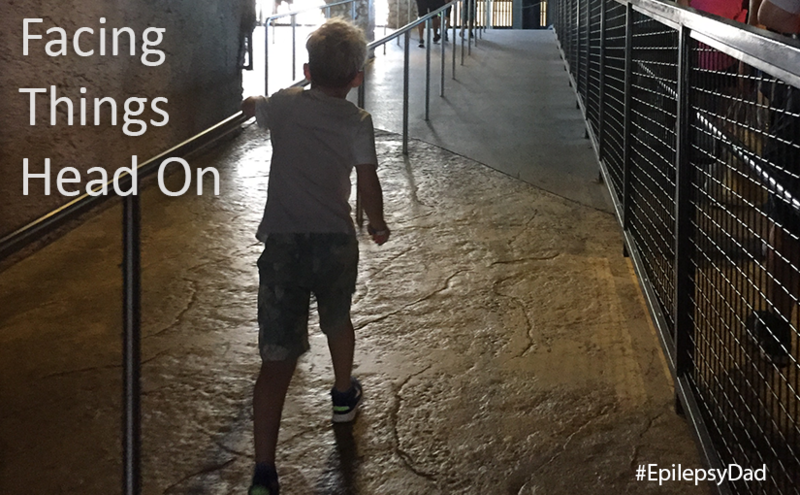 Ever since our last trip to an amusement park (which ended with two missing teeth), he has asked to go back. So, on spring break, we surprised him with a visit to Busch Gardens. For the hour-long car ride, we kept our destination our secret. But as we pulled near the parking lot, the tell-tale blue track of a roller coaster poked above the trees. His excitement filled the car. As we drove around the parking lot that bordered the park, all he talked about was riding a roller coaster. He wanted to go back on the one that had claimed his two front teeth last time. Calling it out was more because it was one of two “big boy” roller coaster that he was tall enough to ride. But I liked to think he wanted revenge. Unfortunately for my son, his date with his nemesis would have to wait. Grandma had bought us tickets for a special safari. 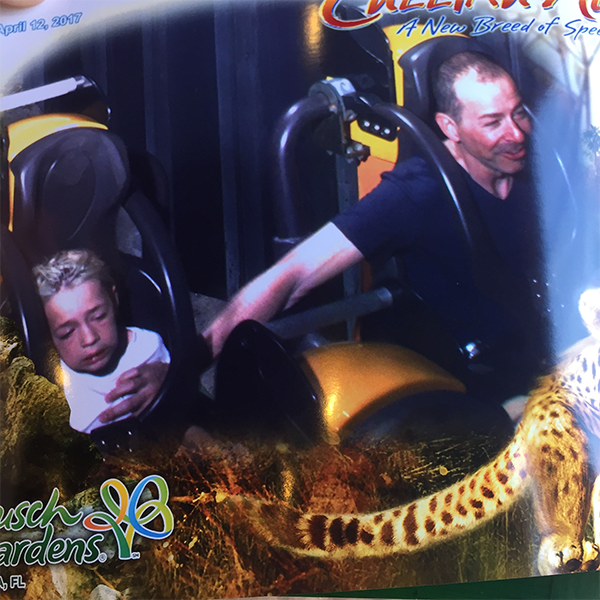 The disappointment was clearly visible on my son’s face, but we still had a great time. As soon as we waved goodbye to our guide and collected our things, though, he led the way to his date with destiny. The last time we rode this roller coaster was my son’s first time on a big one. It includes an unexpected acceleration right out of the gate that launches the cars into the sky. My son’s face hit the harness, leaving him bloody and toothless. But otherwise, he seemed to enjoy it and he even rode another roller coaster later in the day. This time, I expected him to have a much better experience because he was older and a more seasoned rider. That was not to be the case. After the initial speed burst, he was audibly questioning why he made this “bad choice”. I held my hand across his chest as best I could to comfort him (and try to keep his new teeth in place). After another dip and a barrel roll, he said he didn’t feel good. I could see the end of the ride coming up and hoped he could keep his breakfast from coming out. Fortunately, we made it. The ride stopped, the harness lifted, and he carefully climbed out of the car. For the next 30 minutes, he continued to question his life choices. Eventually, he decided that he needed to be “maybe 20” before he tried again. I felt terrible. Partly because, when we stopped to see our picture from the ride, I laughed. A lot. Also partly because we bought a copy of the picture. And also because I posted it online. And now because I’m including it in this post. But I also felt bad because my son was genuinely disappointed in himself because he got scared. Not because he has epilepsy, which has often been a source of frustration. Not because of his meds or because of how many seizures he had. But because he was a normal kid that bit off more than he could chew. Over the past few years, my son’s condition has limited aspects of his life. It’s easier to blame epilepsy when things go wrong. It’s more convenient to have a culprit. But we taught him to listen to his body, to be brave, and that he doesn’t need to do anything that he doesn’t want to. That guidance has served him well, and he’s one of the bravest kids I know. It’s helped during those long hospital stays with relentless testing and needle pricks. It turns out those lessons we taught him are the same he will rely on when things don’t work out. After a long afternoon playing games and riding the kid’s coaster, my son looked at me with a serious look. He took a deep breath, stood in front of me and told me that he wanted to go back on the big roller coaster. My first instinct was to protect him. I didn’t want him to have to put on another brave face and will himself through one more thing. He does it at the doctor. He does it when his body is exhausted but he wants to play or feel normal. I told him that he didn’t have to and that we could ride it next time. But he was determined. We walked back over to the where our day began. 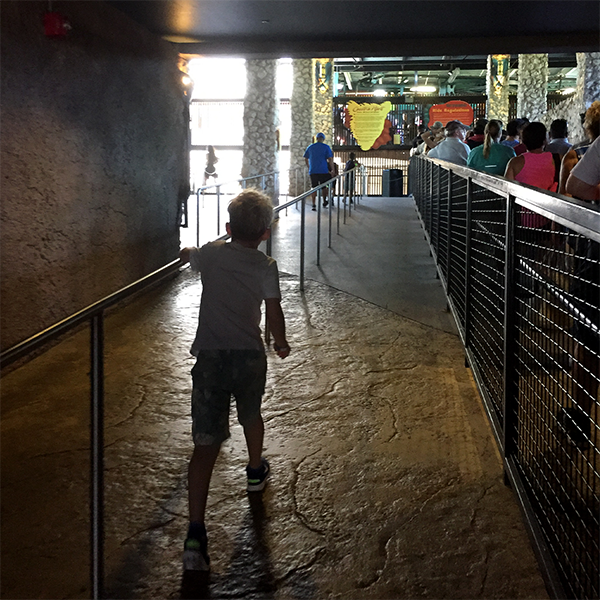 Without hesitation, my son walked past the height check and made his way up the tunnel towards the line. He was meeting this challenge the same way he had faced those presented by his epilepsy.